On the 2013 Labor Day Weekend, Morey's Piers opened its gates to dogs, hosted Battle of the Bands and held a flash mob proposal. This past Labor Day Weekend Morey’s Piers’ Ocean Oasis Waterpark opened its gates for the first time to dogs, with 100% of proceeds benefiting the New Jersey SPCA. 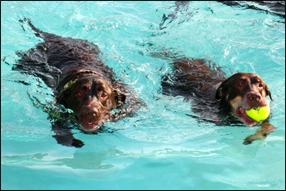 With about 100 “doggies paddling” through the water park, Morey’s Piers raised $2,000 for the New Jersey SPCA. “The event was an overwhelmingly positive experience for guests and their dogs, and visitors can mark their calendars because Morey’s Piers will be going to the dogs again next year,” said Jack Morey, second-generation partner of Morey’s Piers. Dog lovers can watch a recap video of the puppy pool party here and view images of the event here. Battle of the Bands, another first-time event for Morey’s Piers, was held at artBOX, the new 10,000 square foot interactive artists’ colony crafted from 11 re-purposed shipping containers on Adventure Pier. Ten regional bands competed for the coveted title “The King of the Boards.” The Bucks Band of Bucks County, PA took home the winning prize of $1,000 and generously donated it to Juvenile Diabetes Research Foundation in memory of Maryann Ellis, a band member’s parent who recently passed. Music enthusiasts can watch a recap video of the music competition here. 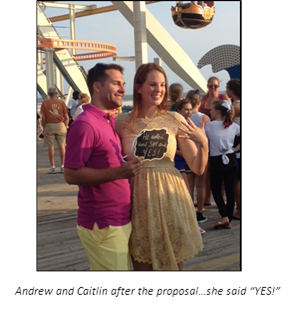 Romance also rocked the boardwalks this weekend during Wildwood’s first recorded flash mob proposal at Mariner’s Landing Pier. Choreographed by Mary Beth Clark from Dance Dynamics Studio of Upper Township, the dancers’ performance lasted about five minutes and featured proposal-appropriate songs, ending with the groom-to-be on bended-knee. Andrew Austin, 23 and Caitlin Cummons, 22, a life-long visitor of Wildwood, met as undergraduate students at East Carolina University. The couple plans to marry in the fall of 2014. Watch the unforgettable and heartwarming proposal here. To continue the charitable efforts of Labor Day Weekend at Morey’s Piers, Jack Morey encourages donations to the New Jersey SPCA and Juvenile Diabetes Research. Morey’s Piers, located on the boardwalk in the Wildwoods, New Jersey is a classic seaside amusement park, family owned and operated since 1969. Voted the third best seaside amusement park in the world by Amusement Today, Morey’s Piers has over 100 rides and attractions spanning over eighteen acres along six beach blocks and includes three amusement piers and two beachfront waterparks. Convenient to the major population centers of the Northeast, yet a world apart, Morey’s Piers along with Morey Resorts combines the pure joy of an amusement park, the sights and sounds of a classic boardwalk, outstanding accommodations, together with the rhythm of beach life. Visit them at Surfside Pier, featuring the Ocean Oasis Waterpark and Beach Club at 25th Avenue, Mariner’s Landing Pier, featuring Raging Waters Waterpark at Schellenger Avenue, and Adventure Pier at Spencer Avenue. For more information, visit www.moreyspiers.com or phone (609) 522-3900.